In2science mentoring relationships have a significantly positive impact on secondary school students’ attitudes towards STEM and STEM career pathways, however it is but once a year that we embrace the opportunity to showcase and celebrate the achievements of the highly dedicated schools, teachers, university student mentors and secondary school students who participate in In2science. Preparing students for STEM careers: how can Industry help? On Thursday 13 September 2018, In2science will host a free forum on industry-school partnerships in STEM education. We invite you to join us to hear from leaders in industry, education and government, and to share your ideas and experiences. Michelle Gallaher, founder of Women in STEMM Australia, Waheed Rashid of Ericsson and panel MC Rachael McCullough of In2science. Supporting Girls in STEM: Strategies for the Classroom and Beyond (#SGISTEM) showcased the ideas, programs, events and organisations that exist to encourage equality of opportunity in STEM. It provided In2science mentors, teachers and members of the STEM education community with the opportunity to engage with a critical issue facing their disciplines. Equally importantly, it helped them to better understand how they can utilise their roles as mentors, teachers, educators and corporate leaders to encourage girls to pursue their interest in STEM. Attendees gained valuable ideas for classroom interventions, mentoring strategies, school collaborations, corporate engagement, and how they can work together to approach issues relating to gender equity. The evening was opened by In2science’s own Rachael McCullough, who pointed out that just as Canadian PM Justin Trudeau had justified his gender-equal cabinet because “it [was] 2015”, we should similarly be boosting gender equity in STEM because it is 2017. The 6 panellists, representing industry, advocacy, secondary and tertiary education sectors commented on what they viewed as the greatest challenges to gender equity in STEM education and STEM careers. Michelle Gallaher, founder of Women in STEMM Australia, pointed out that sometimes men need to step back and support women to take the lead. Waheed Rashid of Ericsson provided a business perspective on the need to increase gender balance and address the shortage of visible female leaders in the corporate world. Dr Christine Redman from the Melbourne Graduate School of Education highlighted the need for boys and girls to work together from a young age in order for both to form positive attitudes about the capabilities of girls. Siddharth Verma, founder of BrainSTEM, advocated an education environment where girls are encouraged to take more risks and learn to not be afraid of failure. Janine McIntosh, manager of the Australian Mathematical Sciences Institute (AMSI) schools programs, highlighted the need to communicate the importance of STEM engagement for females across the entire STEM ‘pipeline’: primary, secondary and tertiary education, through to all stages of career progression. Dr Anita Gamvrellis, a teacher at Wesley College, reminded the audience that teachers, peers, parents and industry professionals are the biggest influences for girls interested in STEM. After the lively and positive panel discussion, the audience and panel split off into two breakout sessions for more focused discussion on ‘Classroom Strategies’ and ‘Industry and Role Models’. These two topics provided attendees with the opportunity to further their expertise based upon their background and interest and to ask questions of panelists. The event concluded with an expo and networking forum in which a diverse range of STEM outreach organisations showcased their programs. These included AMSI Schools / CHOOSEMATHS, BrainSTEM, In2science, The University of Melbourne Physics Society, Robogals, Sisters in Science, STELR (ATSE), and Telescopes in Schools. Participants reported coming away from the event feeling energised and optimistic about the future, and appreciative of the opportunity to mix with like-minded people and share ideas. The event was made possible through the generous funds from The Selby Scientific Foundation. Twitter highlights and a video of the introduction to the #SGISTEM event is available here. In2science eMentoring staff Robyn Gamble and Rachael McCullough with Galen Catholic College teacher Maree Timms (centre). Innovative teaching methods embracing technology to support regional teachers were the focus of the recent Digital Harvest conference held on August 18th in Wangaratta. In2science eMentoring Coordinator Robyn Gamble and Support Officer Rachael McCullough attended the conference to promote the In2science eMentoring program to regional schools in attendance and contribute to the discussion about how digital resources such as eMentoring can help connect students in regional areas. Biology teacher and podcaster Andrew Douch’s keynote address highlighted the need for Australian teachers to prepare students for future demands of the global economy, drawing on an analogy of an ice skater moving to where a puck is heading rather than where the puck has been. He pointed out that because of the unprecedented ease of access to information, educators need to equip students with skills that can’t be automated or outsourced overseas. He said the emphasis needs to be on ‘connecting the dots, not collecting the dots,’ meaning helping students learn how to use the abundant information at their disposal in more clever ways. He also advised teachers to embrace the so-called “Air New Zealand” Teaching Model, automating repetitive teaching tasks by recording lessons on YouTube or as podcasts, to free up class time to focus on the more important human interactions with students and help them develop skills such as critical thinking, problem-solving and teamwork. Another speaker, Mark Woolley from the Wollongong Catholic Education Office, asked the approximately 180 delegates to write one word to inspire your students in STEM. Mentoring scored among the highest in the audience! He noted the declining rates of STEM subject enrolments, particularly for girls and observed that students were less willing to be challenged in school. One possible solution he suggested was to encourage students to enter competitions. Mark also shared a number of online resources for teachers which you can access here. A range of workshops were on offer to help teachers come to grips with coding, 3D design, invention, virtual reality and how to integrate these into classroom teaching. Robyn and Rachael met with eMentoring students at Galen Catholic College. The visit was a valuable opportunity for In2science staff to build upon relationships with regional teachers and help them realise the full benefit for their students of connecting with eMentors. The In2science team is looking forward to attending Digital Harvest 2018! With semester 1 coming to a close, mentors from our four partner universities were treated to a ‘thank-you’ morning tea and a special professional development session. The session was designed to improve the mentors’ awareness of employability skills they have developed while volunteering for the In2science program. The mentor PD was developed with support from the Selby Scientific Foundation. The session highlighted to mentors the non-technical, ‘soft’ skills they put into practise during placement, including initiative, team work, improved communication and organisational skills. This is an important skill set for mentors to develop, as it is estimated by Deloitte Access Economics that soft skill intensive jobs in Australia will grow 2.5x faster than other jobs. Soft skill intensive jobs are expected to make up 63% of all jobs by 2030, which will include managers, engineers, ICT and science technicians. The mentors brainstormed which of those skills they had developed in the classroom. They were shown examples for translating those experiences into responses to job selection criteria and interview questions, then practised responding to selection criteria for graduate roles at government and private organisations citing their In2science experience. University members of the In2science advisory board were also in attendance to help congratulate mentors for their volunteering efforts and present them with certificates of recognition. The 2016 In2science Awards recently recognised and celebrated the outstanding achievements and outcomes in STEM engagement through the In2science peer mentoring program. In2science chairman, The Honourable Professor John Brumby, presented awards to mentors from all four partner universities, and three partner schools at the Melbourne Museum Theatre on Thursday 1st of December. To recognise the efforts of mentors, there were five award categories. To read more detail about the award winners and finalists, click here. In2science Awards winners, staff and university representatives with The Hon. Prof. John Brumby, In2science Chairman. 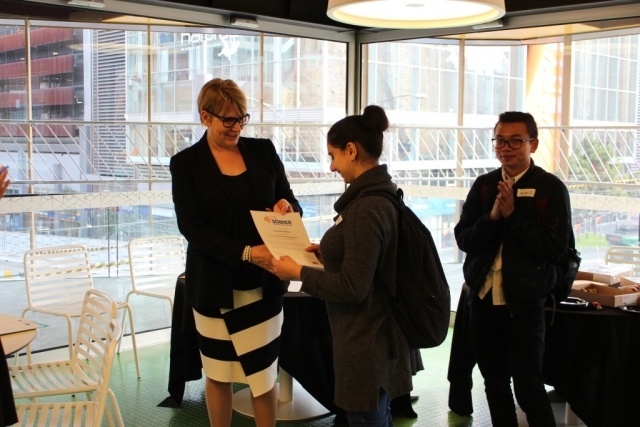 The Mentor Impact Award for the mentor that made the greatest positive impact in engaging students in science or maths went to Selda Ekri from Swinburne University of Technology. The Role Model Award for the mentor recognised as an outstanding role model for their student mentees was accepted by Andres Alzate of The University of Melbourne. The Dedication Award for the mentor that showed greatest dedication and commitment to the In2science program was awarded to Tarik Zepcan of La Trobe University. The Above and Beyond Award for the mentor that showed greatest initiative in engaging students in science or maths went to Shelley Haslett of RMIT University. The eMentoring Award for the most dedicated university mentor in the online eMentoring program was given to Mitchell Griggs of La Trobe University. Three awards were given to teachers and schools for their support of In2science mentors. Teacher Kylie Lambert from Maffra Secondary College traveled nearly three hours to attend the awards and accept the Mentor Support Award for the classroom teacher who provided the most supportive mentoring environment. The Teacher Program Commitment Award for the classroom teacher that showed the greatest commitment to the In2science program went to Jessica Sartori from Brunswick Secondary College. The School Program Commitment Award for the school that demonstrated the greatest engagement with the In2science program was awarded to Bundoora Secondary College, and was accepted on the night by link teacher Ross Goddard. Following the official proceedings, the mentors and teachers mixed over drinks and canapes in the foyer with other guests including representatives of the four partner universities, as well as members of government and industry. For full details about the 2016 In2science Award winners and finalists, click here. To see a photo gallery of the 2016 In2science Awards, click here.